» Reviewed by Marvin Lachman: STEVE FISHER – I Wake Up Screaming. Reviewed by Marvin Lachman: STEVE FISHER – I Wake Up Screaming. STEVE FISHER – I Wake Up Screaming. Dodd Mead & Co., hardcover, 1941. Paperback reprints: Handi-Book #27, 1944. Popular Library #129, no date stated [1947-48]. Bestseller Mystery B204, digest-sized, 1957. Bantam Books A2145, 1960. Black Lizard, 1988. Vintage, 1991. Film: 20th Century-Fox, 1941. Prior to this book, Fisher had written six mystery novels, under three different names, without any great success. For income he depended primarily upon being one of the best and most prolific pulp writers, one willing to write for almost every type of magazine, including Westerns, love stories, adventure, and war. After Screaming became a popular film noir from Twentieth Century Fox, despite the unusual casting of Betty Grable, along with Victor Mature and Laird Cregar, Fisher was able to pursue a career as a successful screen and television writer. He wrote dozens of films, including Lady in the Lake and Dead Reckoning. He also wrote hundreds of television scripts, including shows such as McMillan and Wife and Barnaby Jones. Fisher’s book is a Southern California mystery about a promoter suspected of murdering a starlet. Fisher’s friend and fellow mystery writer, Frank Gruber, once said of him, “Steve was never afraid to put his heart on a printed page,” and that is true of I Wake Up Screaming as he makes us identify with a protagonist on the run from a monomaniacal police detective who is determined to pin the murder on him. We get plenty of evidence here that Fisher had learned his pulp lessons well and was able to write crisp, fast-moving prose. We also get glimpses of the love affair Fisher had with Hollywood, one which, fortunately for him, the town’s major industry reciprocated. Editorial Comment: This book was revised and updated several times over the years. See this earlier post and the comments that follow for some of the details. A good book and film. Even the loose remake VICKI isn’t bad, with Richard Boone in the Laird Cregar role. Fisher’s two pulpish novels about Naval investigator Sheridan Doone are back in print (MURDER IN THE PIG BOAT), and of his books HOMICIDE JOHNNY and SAXON’S GHOST are worth reading and usually not too hard to find (HOMICIDE JOHNNY can be read On-Line). Appropriately Fisher’s television work included episodes of PETER GUNN, 77 SUNSET STRIP, THE WILD WILD WEST, HAVE GUN WILL TRAVEL, COMBAT, CHECKMATE, CANNON, and KOLCHAK THE NIGHT STALKER among others. Screenplays included SONG OF THE THIN MAN, TOKYO JOE, JOHNNY ANGEL, DEAD RECKONING, and LADY IN THE LAKE. Some background on his screen career can be found in his comments on Max Brand in several works. 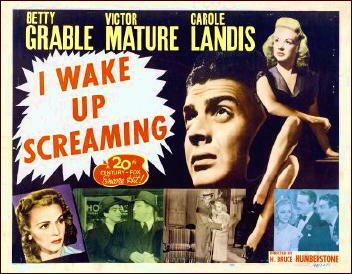 I WAKE UP SCREAMING is one of my favorites, primarily because it’s a genuine whodunit. Suspicion logically shifts from one character to another. Moreover, I’ll bet that few Americans in the audience in the 1940s were expecting the culprit to be … who he or she turned out to be. How closely, if I may ask, does the movie follow the book? I ask, I am embarrassed to say, since I have yet to see the film. I own it, I think, as a collector-to-collector copy, but if I do, it’s in a box of uncatalogued DVDs that I had better start working on soon, or else … I’ll end up with two or three copies of every movie I know I want to watch. So don’t reveal the ending please, either way, whether the book and film are the same or if they diverge in small but significant ways. But I am curious. I just finished reading the book while watching both movies (and boy are my eyes tired! )and they stay pretty close to Fisher’s story. I mean for the movies they do; there’s the usual streamlining, the locale is shifted from LA to NY and the hero is changed from a hack to a flack. Oh, and the frail, consumptive, Woolrich-esque cop Cornell is played by Laird Cregar and in the re-make by Richard Boone, who look about as consumptive as a Kodiak Bear. Nonetheless, the plot is pretty faithfully transcribed to film. And another thing: In the movie WAKE/ SCREAMING, Elishsa Cook Jr. has a very creepy, memorable part. In the remake, it’s played by a singularly unlikeable player who obviously had no future in show business. Am I the only one who raced to IMDB to see who it is that Dan’s talking about. Aaron Spelling was so terrible that he had to stop acting and seek his riches as a producer. No, Walker, I think that you were the only one to admit it!